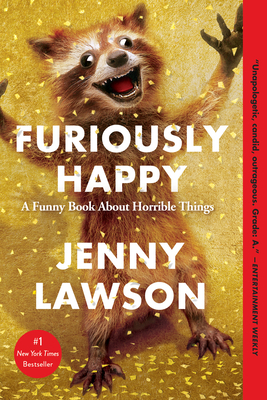 Order Furiously Happy from BookPeople and Jenny Lawson will sign and personalize your book! Add the book to your shopping cart. In the comments field during checkout, indicate the name of the person to whom you'd like the book signed. Please keep in mind that Jenny Lawson is an actual human being who has to drive up to BookPeople, sit down, and sign your book. She does not live here at the bookstore (thought wouldn't it be cool if she did). Orders for personalized copies can take up to 30-60 days to fulfill and ship. We'll let you know approximately when your book will ship when we receive your order. Thank you for supporting a local independent bookstore! "I've often thought that people with severe depression have developed such a well for experiencing extreme emotion that they might be able to experience extreme joy in a way that ‘normal people' also might never understand. And that's what Furiously Happy is all about." Jenny’s readings are standing room only, with fans lining up to have Jenny sign their bottles of Xanax or Prozac as often as they are to have her sign their books. Furiously Happy appeals to Jenny's core fan base but also transcends it. There are so many people out there struggling with depression and mental illness, either themselves or someone in their family—and in Furiously Happy they will find a member of their tribe offering up an uplifting message (via a taxidermied roadkill raccoon). Let's Pretend This Never Happened ostensibly was about embracing your own weirdness, but deep down it was about family. Furiously Happy is about depression and mental illness, but deep down it's about joy—and who doesn't want a bit more of that? JENNY LAWSON, The Bloggess, is an award-winning humor writer known for her great candor in sharing her struggle with depression and mental illness. Her two memoirs, Let's Pretend This Never Happened and Furiously Happy, were #1 New York Times bestsellers.